To play it safe around your home, just remember the rules for using electricity the right way. 1. DON'T plug a bunch of stuff into one outlet or extension cord. It could damage the electrical system in your house or even cause a fire. 2. Make sure all electric cords are tucked away, neat and tidy. Pets might chew on electrical cords, and people might trip and fall. 3. DON'T ever climb the fence around an electrical substation. If a ball or pet gets inside the fence, ask a grown-up to call the electric company - they'll come and get it out for you. 4. DON'T yank an electrical cord from the wall. Pulling on a cord can damage the appliance, the plug or the outlet. 5. 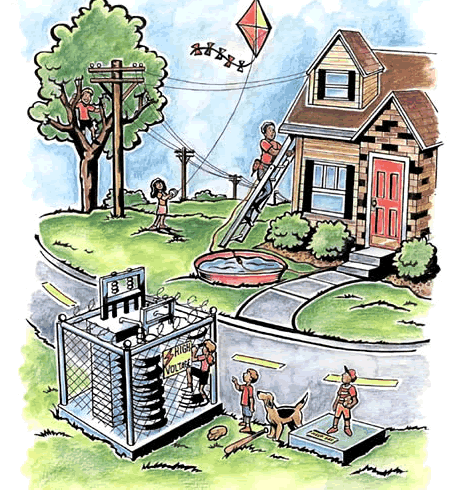 Fly your kite far away from power lines or substations. The kite and the string may conduct electricity - sending it right through you to the ground. when you need to use something that uses electricity. 7. DO look up and look out for power lines before you climb a tree. The electricity can go right through the tree branch - and right through you! 8. Have a grown-up put safety caps on all unused electrical outlets. Covering outlets will also help save energy by stopping cold drafts. when they're using a ladder, chainsaw or other outdoor equipment. 10. Keep electrical stuff far away from water. Most electrical accidents around the house happen when people use electricity near water. It's dangerous to plug too many things into one extension cord. Keep anything that uses electricity far away from water. Never, ever stick anything into an electrical appliance. Don't yank on a cord to unplug something. Help your mom or dad put safety caps on electrical outlets. Stay away from utility boxes - there's dangerous electricity inside. Never, ever try to climb the fence around a substation. Never climb a tree with a power line running through it. 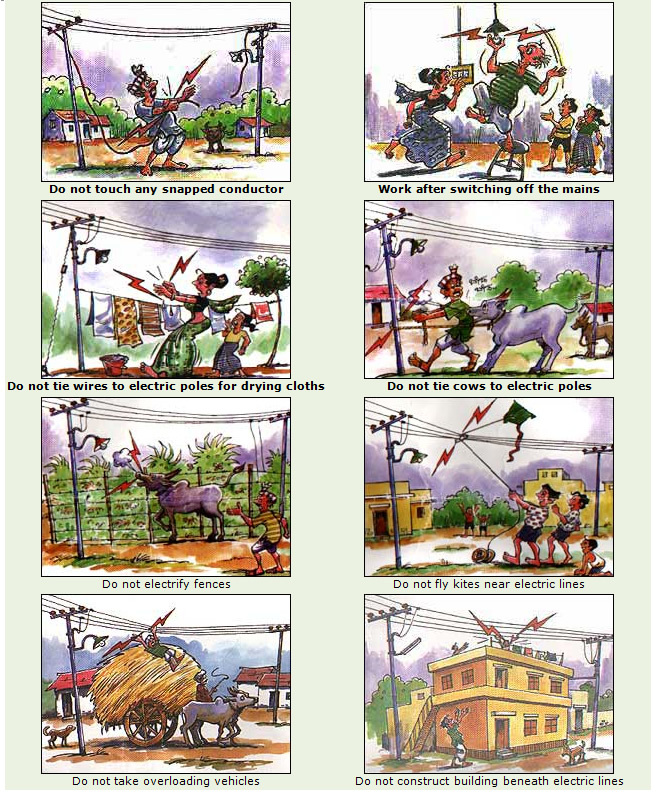 Keep kites far away from power lines. Remind your mom or dad to always look up for overhead power lines. Keep electrical cords far away from water.